Thyroid diseases include hypothyroidism, hyperthyroidism, Hashimoto's thyroiditis, and thyroid cancer. Symptoms of thyroid disease include weight loss or gain, hot flashes, fatigue, constipation, dry skin, and more. 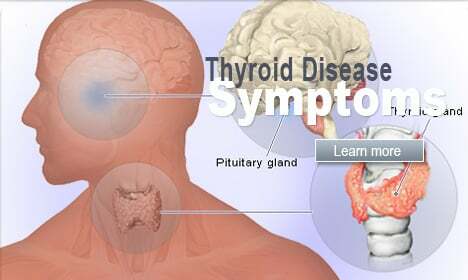 Treatment of thyroid disease depends on the cause of the disease. 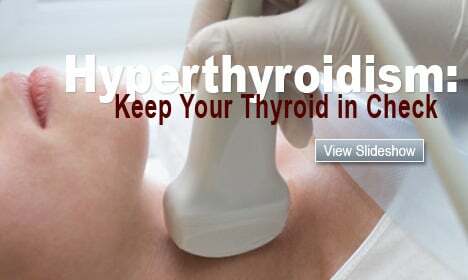 Hyperthyroidism is a condition in which an overactive thyroid gland produces an excessive amount of thyroid hormones. Watch this slideshow to learn causes, symptoms and treatment for hyperthyroidism. 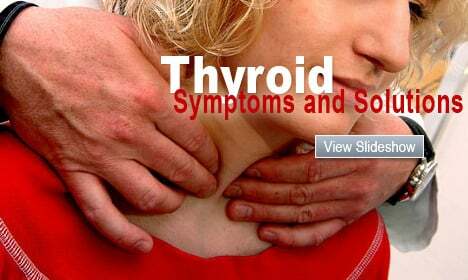 Watch this slideshow on thyroid symptoms and solutions. Fatigue, weight gain, hair loss, depression, could your thyroid be to blame? We look at hidden thyroid disorders, the tests and treatments, with pictures and illustrations. Learn about hyperthyroidism (overactive thyroid gland) symptoms such as irritability, tachycardia, heat intolerance, increased sweating, weight gain, and more, as well as the causes, diagnosis, and treatment of hyperthyroidism. View an illustration of thyroid anatomy and learn about thyroid conditions such as thyroiditis and hyperthyroidism as well as tests and treatment. Learn about Hypothyroidism (underactive thyroid) including causes, symptoms (such as weight gain, fatigue, and depression), diagnosis, and treatment. Do Allergy Drugs Interact with Synthroid? Can Soy Foods Block Synthroid Absorption? Does Hashimoto's Thyroiditis Cause Other Diseases? Does Hashimoto's Affect Heart Disease and Osteoporosis? Potassium Iodide Pills: Can They Protect You From Radiation Exposure? What Vitamins or Foods Interfere with Synthroid?